Haldor Topsøe is a leading supplier of SCR DeNOx catalysts, which are tailored to suit a comprehensive range of applications. The Topsøe DNX® catalysts are of the corrugated type and are produced in 10 different channel sizes to cater for different dust content of the process gas and 10 different chemical compositions are available to ensure optimal operation for each individual application. Topsøe’s DNX® catalysts are based on a porous, fibre-reinforced titania carrier, which is homogeneously impregnated with the active components, oxides of tungsten and vanadium. 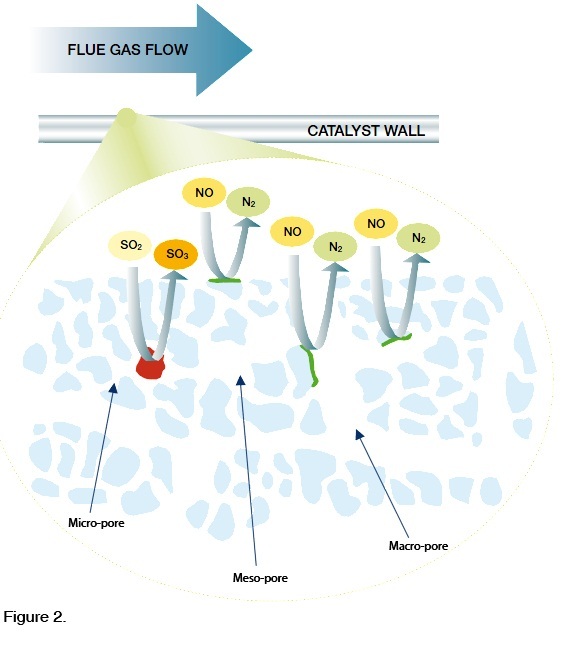 In the unique manufacturing process the DNX® catalyst gets a welldefined and controlled tri-modal pore structure to ensure optimum access to all the catalytically active sites. of active sites and thus a high activity. DNX® has yielded NOx conversion rates in excess of 95% in industrial applications. DNX® pore-size distribution. 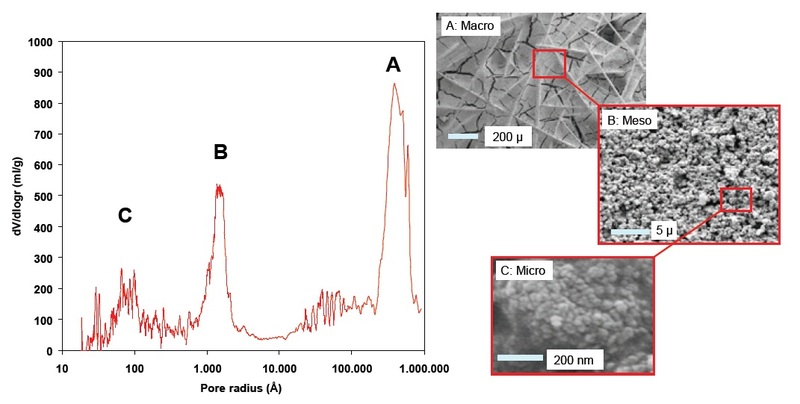 The three pore-size regimes - A: Macro-pores, B: Meso-pores, C: Micro-pores - are visualised by scanning electron microscopy (SEM). 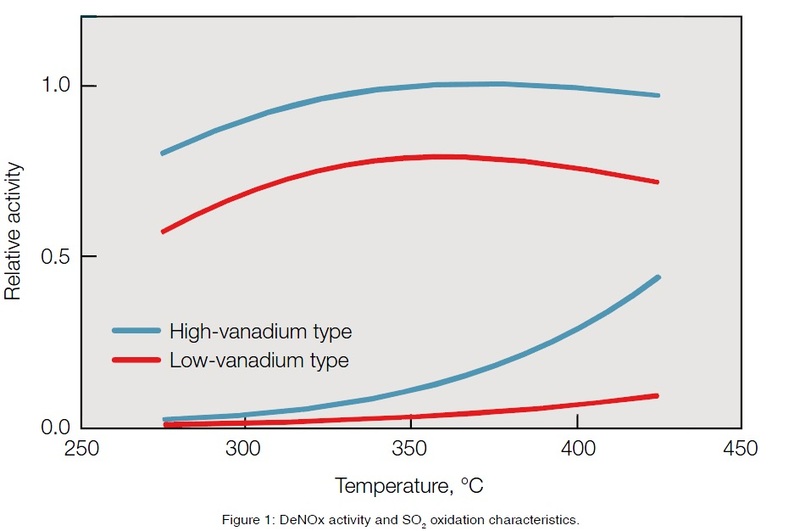 The high internal efficiency of the DNX® catalyst allows for comparatively low vanadium pentoxide content and as a result, the DNX® catalysts have a remarkably low ratio of SO2-oxidation. The low SO2-oxidation activity has been demonstrated and SO2 oxidation rates down to 0.1% have been designed for and guaranteed in coal-fired power plants. The optimised pore structure also results in a catalyst with a large capacity for absorbing poisons without the normal detriment to the activity. Data have demonstrated that even with several per cent of poisonous constituents accumulated in the catalyst, it remains active. The presence of macro-pores also ensures access to the active catalyst sites even when burning coals with a high calcium content. catalyst extremely responsive to rapid changes in plant load compared to more dense extruded or plate-type catalysts. The active corrugated structure is housed in steel casings forming elements. Using a sturdy framework these elements are packaged to form modules. in SCR units on boilers firing high-calcium PRB coals. 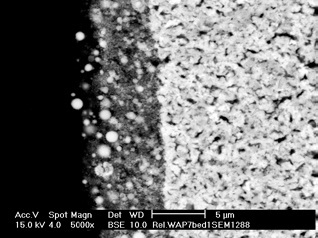 Scanning electron microscopy picture of catalyst surface before and after exposure in an SCR unit firing high-calcium PRB coal. 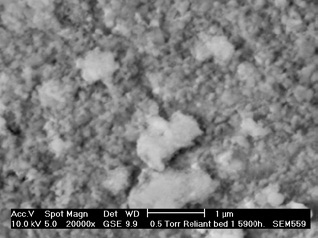 The photo to the right shows a dense fouling layer of amorphous calcium sulphate. Pore plugging is observed in combination with a fine deposit of sub-micron fly ash particles. The conversion of NOx on a catalyst takes place on both the inner and outer surfaces of the catalyst. As the outer catalyst surface easily fouls by calcium, access to the interior becomes even more important as illustrated in Figure 2.
structure, access remains available via macro- and meso-pores. 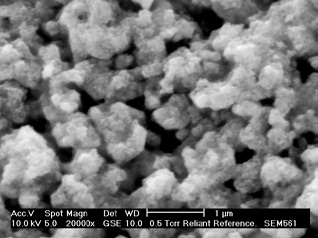 This very unique pore structure of Topsøe’s DNX® catalysts is a result of careful selected titania raw materials combined with several controlled drying and calcination processes in the fullyautomated catalyst manufacture. Topsøe’s DNX® catalysts are developed to maximise the resistance of the catalyst towards calcium in fly ash and have proven to offer a long useful service life, minimising catalyst consumption and operating costs. Figure 2 demonstrates that this benefit is significant. The tri-modal pore structure further results in a high resistanceto other poisons like arsenic while at the same time providing thelowest SO2 oxidation on the market. The large-size pores, macro-pores, serve to ensure access to the active interior of the catalyst even if large amounts of poisons have been deposited on the catalyst. They further enhance gas-phase diffusion of NOx and ammonia into the catalyst and thereby the overall catalyst activity. The presence of medium-size pores, meso-pores, ensures an efficient internal distribution of the reactants to the immense network of micro-pores which provide a very high active surface area necessary for the catalyst activity. Figure 1: DeNOx activity and SO2 oxidation characteristics. where As is the specific active surface area (m2/m3), C is the percentage of vanadium in the catalysts and η is the effectiveness factor accounting for the resistance towards diffusion of NOx and ammonia to the catalyst active sites. where ASO2 is the activity towards SO2 oxidation and W is the bulk density of the catalyst. The special way of manufacturing the Topsøe DNX® catalyst allows for careful control of the pore structure within the catalyst and this has been optimised with a tri-modal pore structure as shown in Figure 2.
system further increases the porosity (As/W) and gives the lowest possible SO2-oxidation as per (3). 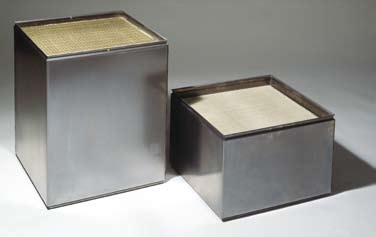 A direct comparison of the bulk density of DNX® with other catalysts will serve to illustrate this fact. The low SO2 oxidation of the Topsøe DNX® catalyst has been verified by testing in the industry. 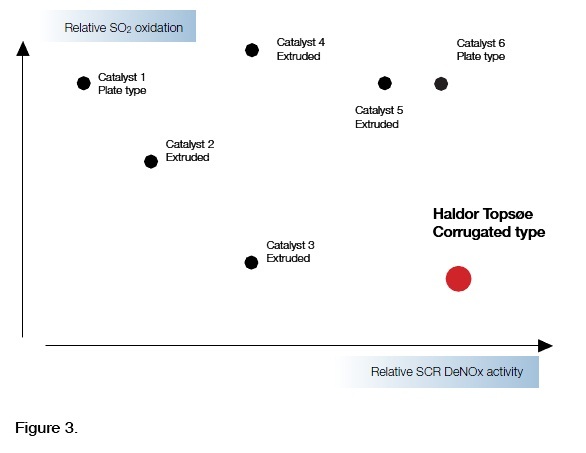 Figure 3 illustrates such a comparison where standard extruded catalysts and plate-type catalysts with a much lower porosity show a much inferior ratio between SO2 oxidation and DeNOx activity than Topsøe’s DNX® catalyst. 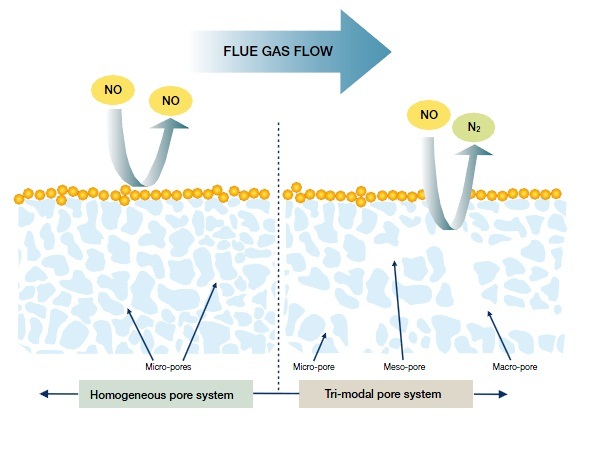 Topsøe is capable of tailor-making catalysts for any application and for any level of sulphur in the fuel and can therefore provide the best compromise between NOx removal and SO2 oxidation. Topsøe has demonstrated superior performance together with low SO2 oxidation under industrial conditions and has provided guarantees for SO2 oxidation down to 0.1%.